Augsburg students, as well as former GEMS students, serve as mentors. These opportunities not only give the younger students valuable opportunities, but the Augsburg students valuable teaching experience while building their own confidence and knowledge in math and science. 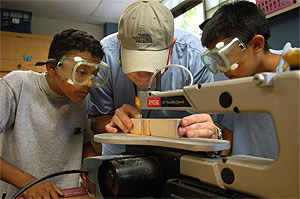 Students in the program work on a variety of projects, including a robotics class, in which they are building a replica of a space capsule and a “Make Up Your Mind” class, where the students make their own cosmetics. GEMS and GISE runs through August.